Synthetic peptide within Human ITGA8 aa 1032-1061 (C terminal) conjugated to Keyhole Limpet Haemocyanin (KLH). The exact sequence is proprietary. 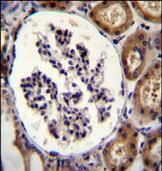 K562 cell lysate, Human kidney tissue. Our Abpromise guarantee covers the use of ab170464 in the following tested applications. WB 1/100 - 1/500. Predicted molecular weight: 117 kDa. Integrin alpha-8/beta-1 functions in the genesis of kidney and probably of other organs by regulating the recruitment of mesenchymal cells into epithelial structures. It recognizes the sequence R-G-D in a wide array of ligands including TNC, FN1, SPP1 TGFB1, TGFB3 and VTN. NPNT is probably its functional ligand in kidney genesis. Neuronal receptor for TNC it mediates cell-cell interactions and regulates neurite outgrowth of sensory and motor neurons. Expressed in mesenchymal cells, including alveolar myofibroblasts, kidney mesangial cells and hepatic stellar cells and vascular and visceral smooth muscle (at protein level). Immunohistochemical analysis of formalin-fixed paraffin-embedded Human kidney tissue, labeling ITGA8 using ab170464 at a 1/50 dilution, followed by peroxidase conjugation of the secondary antibody and DAB staining. ab170464 has not yet been referenced specifically in any publications. Publishing research using ab170464? Please let us know so that we can cite the reference in this datasheet. There are currently no Customer reviews or Questions for ab170464.